MAYITA’S Taco Wednesdays are not your regular taco nights. At MAYITA, every Wednesday you can find a taco sampler special. 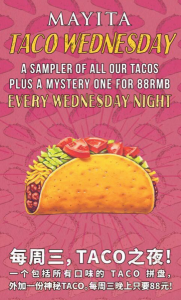 For 88RMB you can get a sampler of all our 5 mini tacos on the menu plus a mystery one we change every week. Hope to see you there! Please call MAYITA at 6334-3288 for reservations.